The Knight-Batten Awards for Innovations in Journalism recently announced the recipients of this year’s honors. 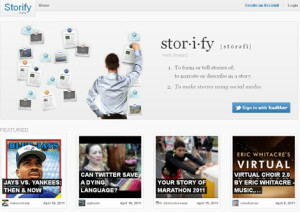 The $10,000 grand prize was awarded to Storify for its drag-and-drop utilities that allow users to create dynamic, multimedia, Web-based stories in an embeddable platform. Creators can pull together video, photos, and text from sites like Twitter, Flickr, YouTube, and Facebook. The John S. and James L. Knight Foundation funds the Knight-Batten Awards for Innovations in Journalism, which provides $16,000 to honor creative use of technologies in the news industry. Particular attention is paid to ideas that significantly enhance digital engagement, such as increasing audience participation or finding new ways to disseminate information. The awards are administered by J-Lab: The Institute for Interactive Journalism at the American University School of Communication. It’s not surprising that Storify took home the grand prize since several of the other 123 entries built their own submissions using the tool. “In Storify, we see a journalism tool that truly solves a newsroom problem and also inspires others to challenge the way they’ve been telling stories,” says Knight-Batten judge Amy Webb, speaking for the selection panel. Special Distinction Awards, which also include cash prizes, went to NPR‘s Andy Carvin, West Africa Democracy Radio, Bloomberg Government, and The Texas Tribune. Honorable mentions were given to Biblion, NewHavenIndependent.org, Guardian Data, and Bay Citizen Bike Tracker. All of the winners will discuss their projects at a symposium and luncheon September 7 at the Newseum in Washington, D.C. The keynote speaker will be Katharine Weymouth, CEO of Washington Post Media and publisher of The Washington Post. There are other organizations currently making innovative strides in the news industry. The projects listed below are but a few examples. Truthsquad began as a news curator, but will shift into a new role as fact-checking network this fall, motivated by the upcoming elections. The site will offer tools, including embeddable widgets, to allow the public to help separate fact from fiction in reporting. Readers cast their vote then submit supporting evidence, and Truthsquad editors render the final verdict. The organization recently received additional financial backing from Craig Newmark and began a partnership with the Center for Public Integrity. In partnership with the newspapers of the Bay Area News Group (BANG), Tackable has rolled out an iPad app called TapIn BayArea. Tackable co-founder Luke Stangel dubs it “the world’s first location-aware digital newspaper.” Users can submit a variety of news items based on their location, either in response to “gigs” from journalists at partner newspapers or of their own accord. Newsmotion, a new startup produced by a collective of award-winning journalists and media industry insiders, aims to cover international events with long-term storytelling continuity in mind. The site hasn’t launched yet, but plans to combine yet distinguish coverage from three different sources — Official, Unofficial, and Citizen. A byproduct of the Egyptian revolution coverage, Newsmotion will pay special attention to topics such as social justice and human rights. Screen capture of Storify used under Fair Use: Reporting.